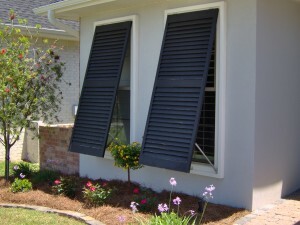 Do you need hurricane shutters for your home in Pensacola, Florida, or a surrounding city? If so, turn to Majors Home Improvement, a local, family-owned company that has been providing area residents with expert installation services, top-notch products, and unsurpassed customer service since 1997. Our hurricane shutters are sure to increase the overall value of your home, and they are also the most cost-effective way to protect your home and family during a storm. Rolling shutters – These will have minimum impact on the architectural integrity of your home. They are stored in an enclosed box above your windows when they’re not in use and can be manually or automatically lowered when needed. Colonial shutters – These two-piece shutters decoratively attach to the wall beside your windows, folding together to protect the windows during a storm. Bahama shutters – These one-piece hurricane shutters can be propped open to offer shade over the windows, or lowered and secured to the wall when needed for protection. Accordion shutters – These shutters unfold easily when needed during a storm. And, while they are permanently affixed to your windows, they are not bulky and will beautifully complement the exterior of your home. Storm panels – These panels secure to the outside of your house using bolts or tracks, providing excellent protection. Since they can be stowed away when not in use, they won’t change the look of your home, and they are even available in a clear panel option. Any of these hurricane shutters can be installed by our professional technicians, who are factory trained and highly experienced. Plus, you’ll receive a lifetime warranty, ensuring your investment is fully protected. Contact Majors Home Improvement today to learn more about our hurricane shutters for homeowners in Pensacola, FL, and the surrounding communities. When you do, we’ll be happy to schedule a complimentary consultation at your home at your convenience.